The vertical platform lift can be unenclosed or may require a shaftway/enclosure to meet code requirements. Shaftways are constructed and are similar to an elevator shaftway. Doors/gates can be provided by the lift manufacturer or, if code allows, you can provide. Lifts can be free-standing, installed inside a constructed shaftway (like an elevator), or be installed inside a factory-provided enclosure (a free-standing shaftway - plexiglass or steel panels are typical). A vertical lift is an ADA compliant solution that can be customized complement any decor. The factory enclosure is an option from Garaventa Lift; we would assemble and install as part of the lift installation process. Enclosure panels can be steel, plexiglass (bronze or clear), or glass depending on your design needs. Lifts can be floor-mounted (ramp would be needed at a lower landing) or installed in a pit 3 1/2" deep. The platform has 42" high sidewalls for safe vertical travel. The lift is operated by constant-pressure controls to call/send and go up/down. This type of lift has a maximum 14 ft. of vertical travel. For higher elevations, code requires an elevator be provided. Many options and configurations are availble to fit your home or business. This type of lift allows the rider to travel up/down the staircase on a solid platform. These lifts can be residential/commercial or indoor/outdoor. Outdoor models need a covering to prevent ice & snow buildup on the rail system. The rail system is wall-mounted or tower-mounted depending on site conditions and owner preference. When not in use, the platform folds up to occupy as little as 11" from the adjacent wall. When unfolded, the platform occupies more space; our estimators can measure your staircase to determine if an inclined platform lift would fit. 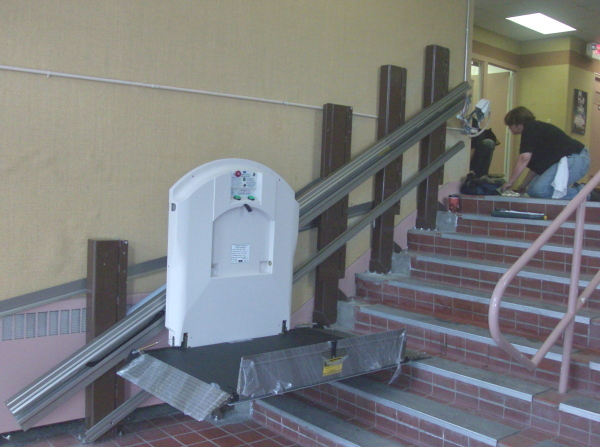 Inclined platform lifts in many public buildings as an ADA compliant solution. We've installed this type of lift at Bailey's Furniture in Fairbanks, Joint Base Elmendorf-Richardson, Ft. Wainwright, and many other private residences, schools, & businesses in Alaska. Stair-Trac: Person seated in a manual wheelchair is secured to the Stair-Trac device. 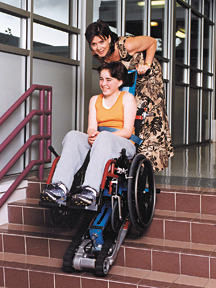 Lift user rides in a semi-reclined position on the Stair-Trac. The battery-powered Stair-Trac has a mechanized rubber tread which "climbs" up/down stairs. This unit requires an trained attendant to guide the device up/down the stairs. Weight limit is 285 lbs. Super-Trac: Person seated in wheelchair is secured to a solid platform on the Super-Trac lift. It has a mechanized rubber tread which "climbs" up/down the stairs. This battery-powered unit also requires a trained attendant to guide it up/down the stairs. Weight limit is 440 lbs. The "Staage" lift is a portable vertical platform lift that is not permanently installed. This wheeled lift can be moved to different locations and plugs into a standard 110V power outlet. This lift can travel up to 45" of vertical rise and has a roomy platform size 34" x 54 1/2". Weight limit is 750 lbs.